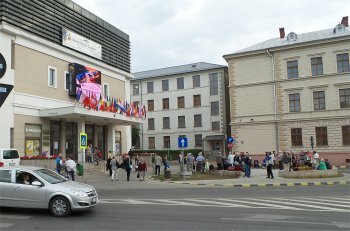 Delegates arriving at the cinema. Gathering for the opening banquet. UNICA is the umbrella organisation for national, non-commercial film-making federations. For one week each year it arranges a festival where the nations compete. Each member country can present a programme of up to an hour's length. An international jury discusses the films and awards prizes, including the coveted "Most Interesting National Programme" one. But the real importance of the event is that delegates from member nations meet and socialise; discuss the films and common problems; and make good friends. Through a shared interest in our kind of film making UNICA contributes to better understanding between nations. A week-long festival could be hard going, but the timetable allows time for relaxation, includes excursions, various meetings, banquets and entertainments. It is held in a different country each year, offering a chance to visit new places. Anyone can come to UNICA. You do not have to be a film maker or an official. The next UNICA will be held in Dortmund in Germany on 5th to 12th August 2017. It will be a double celebration. BDFA, the German equivalent of the IAC, will be 90 years old. The venue, Zeche Zollern, is a former colliery - now a huge industrial museum with space for a cinema, restaurant and places to talk. UNICA delegates come from many of the thirty member countries. If you are interested in joining us, there are sure to be people you know in the British group and you will quickly make new friends from other countries. Email Dave Watterson (asstweb@theiac.org.uk) or Jan watterson (webmaster@theiac.org.uk) and we will keep you up to date with plans, travel suggestions and so on. One of the world-heritage painted monasteries. One of the outstanding features of this UNICA was the food. 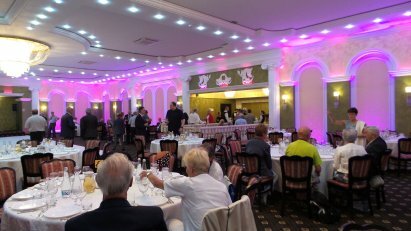 The outings and opening and closing events gave the Romanians the chance to ply us with delicious four and five course meals. At the other extreme, your webmaster and the President of UNICA managed to grab a quick al fresco meal between film shows. 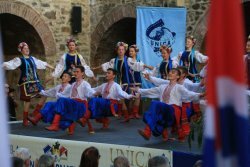 UNICA is an opportunity for the host country to show delegates examples of their cultural heritage. The Romanians entertained us with folk dances and music and persuaded many of us to join in with their version of Hora (circle dance). 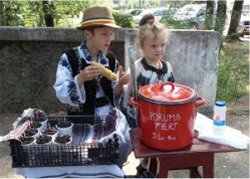 The museum of history in Suceava covers 5,000 years of life in the Bucovina area.